Very quiet place surrounded by nature but just 8 km away from the motorway to Siena and Perugia and 12 km from the A1 highway that allow you to easily reach Siena, Perugia, Florence, Arezzo, Rome and the sea 50 km away. Ideal place for those who love nature, gastronomy, wine and the Tuscan oil. In the ancient farmhouse we can host up to 12+2 people. 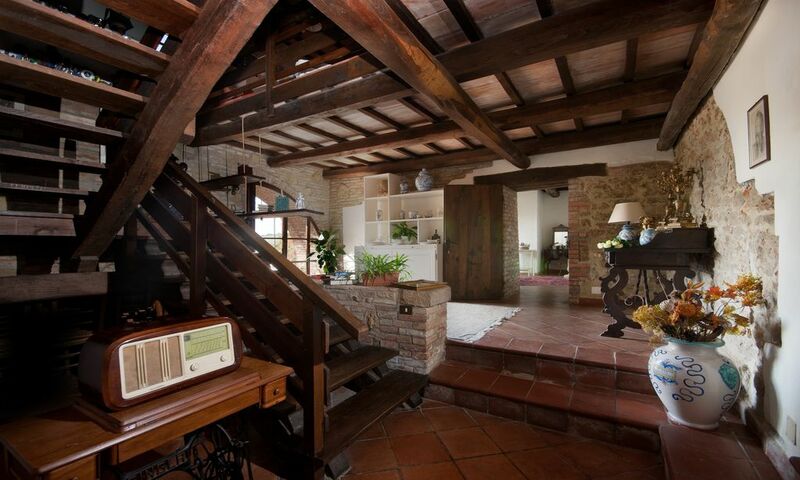 The farmhouse can be divided into 2 big apartments called LIPPO VANNI (8 PEOPLE) and DUCCIO da Buoninsegna (4+2 PEOPLE). The apartment is situated in an independent area od the farmhouse. It is composed of 3 floors, linked with each other by some internal staircases. Ground floor: Entrance and master bedroom. First floor: Big kitchen with fireplace and big ancient marble table. Sitting room with sofas, fireplace, tv. Second floor: 3 master bedrooms, 2 bathrooms (1 with shower and 1 with shower and bath tub). From the ground floor you can get to a big terrace with panoramic view, gazebo and table. From the ground floor you can get to the shared areas like the square of the stables and the salon of the parties with fireplace, sofas, pool table and radio with CDs. The apartment has 2 independent entrances. BATHROOMS:	3 bathrooms (2 with shower and 1 with shower and bath tub). With a typical Tuscan style and elegant furniture, Duccio di Boninsegna (4+2) is situated in an independent area of the farmhouse Casale Padronale del Renello It features 2 floors linked with each other through an interior staircase. big sitting room (60 sq m) with dining area and sofas. Wood stove included. kitchen with fridge and freezer, dishwasher, fireplace and big dining table, entrance with internal independent staircase. Large internal area equipped with table and parasol, for guests only. Ancient building recently renovated and tastefully furnished, composed of a big kitchen with fireplace, sitting room and bathroom on the ground floor. On the first floor there are 2 bedrooms. This independent house has a garden surrounded by nature, cypresses and olive trees. Single cottage of 1 floor, fully independent. Ancient building tastefully furnished and recently renovated. This independent house is surrounded by magnificent roses. It has a private garden with cypresses, oaks and nut-trees, equipped with table and loungers. Recently renovated, it features elegant furniture and is on the ground floor of the ancient stable that once was home to the Chianina bulls. The apartment has 2 master bedrooms with private bathroom and shower. A big sitting room (38 sq m) is situated in the central area of the apartment with sofa and fireplace. In the sitting room there is also a kitchen with oven, fridge, freezer, dishwasher. Through an external staircase you can get to a big panoramic terrace equipped with table, for guests only. Elegant and tastefully furnished bedrooms with all modern comforts. They overlook the magnificent landscape of the Val d’Orcia. A nearby sitting room is for guests only and here you can relax and chat. All b&bs have outdoor areas equipped with tables, chairs, loungers to relax. I’m an agronomist and I manage the Renello farm with my wife Rossella and my children Andrea and Laura from 2004. The farm is 600 m away from the hills of the Crete Senesi and is situated between 2 districts: Trequanda and Torrita di Siena. The region is famous for its high quality oil and wine (Chianti, Nobile di Montepulciano and Brunello di Montalcino). I'm passionate about high quality oil, that’s the reason why I grow 9000 olive trees of 12 different varieties. I also arrange some oil tastings in order to share my passion with our guests. The weekly change of linen is included in the price. In LIppo: 2 fireplaces, in Duccio: 2 fireplaces. Weekly change of linen included. Pool towels are optional. All kitchens have a gas kitchenette. LIPPO Vanni and DUCCIO have their own kitchen equipped with dishwasher, freezer, tables, chairs. The kitchens of LIPPO and Duccio houses have big dining tables. You can also dine outdoor or in the shared sitting room on the ground floor. The farm Renello produces different types of extra virgin olive oil, with 12 varieties and about 10.000 trees. You can taste our high quality olive oil. The farm also features a big selection of wines in its cellar. "BELLISSIMO. INSERITO IN UN CONTESTO MOZZAFIATO. CON TUTTE LE ATTREZZATURE NECESSARIE. MOLTO CURATO NEI PARTICOLARI. STANZE AMPIE, ARREDATE CON GRAN GUSTO E PULITE. PROPRIETARI MOLTO DISPONIBILI, CORTESI E DISCRETI. DA PROVARE LA LORO CUCINA E DA VERI INTENDITORI L'OLIO DI PROPRIA PRODUZIONE." After 2 Km You will find Renello on the left. Our Farm is one of the biggest in Tuscany for olives trees. We produce many different Oils of olives extravergine,also wine, fruit,vegetable, and Tarfufi white. Tariffe scontate del 5% per prenotazioni di 2 settimane. Tariffe in funzione del numero di persone. Richiesto supplemento per il riscaldamento del Casale in base alla stagione e in base al consume effettivo. Richiesto supplemento aria condizionata in base al consumo (solo nei cottage Tabacchiera e Granaio). Caparra richiesta alla prenotazione. Consegna delle chiavi da parte del Proprietario presente in loco.